The Green Phone Booth: Cookbook Roundup! I read cookbooks the way some people read novels. I love them. When I go to visit people, especially my mom, I'll spend ages poring over different books, especially themed ones about different ethnic cooking techniques or styles of food. I'm the kind of cook, by the way, who honestly seldom actually follows a recipe unless it's for baked goods of some kind where adherence to correct proportions is crucial to success of the dish. Even then I tend to futz a lot. So I usually read cookbooks more for ideas than anything else. Still, they are an invaluable resource, even when I do mess around with ingredients a lot. And also to be honest, my primary cookbook is called "the internet." If there's something I want to make and I don't immediately know which hard copy cookbook it lives in, I go to the web and find six versions of whatever I want to make, pick the best-looking one, and tweak based on others as needed. Works for me. But I still love my cookbooks. 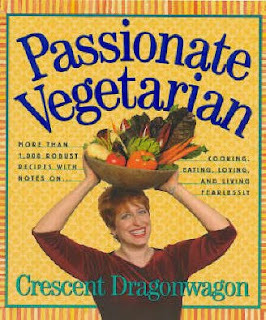 The Passionate Ve getarian, by Crescent Dragonwagon--okay, this might be completely on the beaten track, I just didn't know about it until my good friend Regina recommended it to me based on my recent post about how absolutely scary and gross the very concept of meat-eating seems to be becoming unless we can find humanely (and thus also safely) raised meat. Honestly, all I had to hear was the author's name to explore further, and I love her writing style. This book is a tome--it's over 1000 pages and reads like a bodice-ripper; she's not kidding about the "passionate" part. This has an unbelievable collection of meatless recipes, all addressed in the author's inimitable style--this is a cookbook written by a writer. I only received it yesterday, and I'm still on the hors d'oevres chapter, but this thing is awesome. Make it Fast, Cook it Slow by Stephanie O'Dea--okay, disclosure: I don't own this one. Yet. but Stephanie's A Year of Slow Cooking blog has been a huge inspiration to me especially over the past year or so, and I'm totally going to get that book. Soon. This is the ultimate harried mom who's just trying to get food on the table that her kids might even eat, without much time to do it, and she's awesome. Sundays at Moosewood Restaurant--one of the cool things about Moosewood is that every Sunday night would be "ethnic" night, where a particular regional or cultural cuisine was featured. (I don't know if they still do this or not; I'd be disappointed if they didn't.) So this is the cookbook with recipes from a whole bunch of those different ethnicities and cultures, separated by region--South Africa, North Africa, Armenia, Middle East, Japan, India, Chile...it goes on and on. Up until Crescent Dragonwagon's book came in the mail yesterday, this has been my most fun cookbook to just sit and read, and it's got a bunch of great recipes I use often, though I've honestly barely scratched the surface. And this book came out in 1990, years before we could all just hop on the internet and find out how to make injera bread or dolmades. Moosewood Restaurant Book of Desserts--go directly to page 57; of all the recipes for Pumpkin-Pecan pie you'll find all over the place, this one beats the stuffing out of all of them. And it's full of stuff like that--we also make the "Nutty Fruit Nuggets" a lot, basically a mixture of nuts, dried fruit, and wheat germ you roll into balls and roll in nuts or more wheat germ, for a healthy candy-type treat. (Okay, there, I just told you how to make it, so you don't really need the book for that, I guess.) And since desserts, since they are often baked, also fall into that can't-really-improvise category, I tend to pull this one out a lot too. It also has a great section at the end where it categorizes recipes into groups--these are the "impressive for company" ones, these are easier for beginning cooks, these are fun to make with kids--and another mix-and-match page where it tells you where to find all the pie crusts, all the fillings, all the frostings, so you can mix and match for whatever result you're interested in trying this time. Just like Sundays at Moosewood is a mostly-veggie cookbook that you barely notice has very little meat, this is a wholesome made-from-good-stuff dessert cookbook that doesn't make a production about being "natural." It just is. The New Basics, by Julee Rosso and Sheila Lukins--these are the ladies who also do the "Silver Palate" books and I think had a very chi-chi store in Manhattan. This is another cookbook that's as good for a great read as it is for its great recipes, and it's also where I get my Thanksgiving Turkey recipe every year. (page 423; I don't even look it up any more, just let the book flop open to the most-used broken-binding page.) This is a cookbook that doesn't scream "I'm green! Look how All Natural we are!" --it just has caught on to the whole idea that to cook delicious and beautiful food is to use beautiful fresh ingredients cooked well and simply. It's full of neat tricks for kicking ordinary cooking up a notch into extraordinary and fabulous, and has a lot of good basic information about cooking with said fresh ingredients--different veggies and what to do with them, poultry, meats, grains--I sort of consider it to be a "cooking basics 201" kind of book, not for the complete beginner who doesn't know a saucepan from a skillet (i.e. my husband, who literally doesn't know a saucepan from a skillet), but a nice second step for making stuff more interesting without necessarily making it take longer or be more difficult. C'mon America, Let's Eat, by Susan Powter--Okay, I was hesitant to include this one, because it's sort of old, it was written during the "all carbs are good all fat is bad" food fad era, and Susan Powter is sort of (IMO) crazy/obnoxious/whatever. (Remember the blond woman with the crew cut who was sort of the Chick Richard Simmons for a while?) Okay, yeah, she's sort of nuts, and I wouldn't buy fat free sour cream or fat free cheese or substitute-weird-chemical-things-for-fat-anything any more, but I have to admit this was a good cookbook. If you can ignore the sort of long-since-proven-wrong ideologies that pop up on every page, this is a really helpful busy-parent-want-good-stuff-don't-have-time-to-cook-much day to day cookbook. She advertises in it that it's full of lightened up versions of otherwise way too fattening recipes, and she does a pretty good job. Her low-fat cornbread recipe (substituting sour cream for most of the fat) is probably one of the best I've ever had, and she's the one who turned me on to substituting grated vegetables for huge proportions of the meat in meatloaf and still having it taste like meatloaf. I'm not saying "go out and buy it TODAY!" --but if you run across a used copy, it's really got some worthwhile recipes in it, especially if you're trying to tread that balance between not eating processed food and not wanting to put a stick of butter into everything. Also, greenie types will only find this one useful if you are comfortable with basic cooking substitutions and are able to good-naturedly roll your eyes at how bizarre our 1990's cooking thoughts were and switch out the crap for good stuff. Your mileage may vary. And last but not least, my genuine favorite cookbook ever--when I moved out into my first apartment, my mom gave me one of my two favorite housewarming presents of all time. (The other was a gift from my dad, my very own tool-box, appropriately stocked for the woman-in-her-twenties-living-alone. Hammer, screwdrivers, wrenches, pliers, just a basic hand tool set.) She had gotten one of those three-ring cookbooks full of blank pages and about half-filled it with the recipes I'd grown up eating--her chili, her spaghetti sauce, her stroganoff, her paprikas, her popovers, I forget what-all else, but it was good stuff. I've added to it over time, and I've filled the margins with notes about things she left out or didn't specify (at age 23 "cook in a good sized pot till done" wasn't always helpful to me), but this is still the ultimate good cookbook. I've added some of my own recipes over time, my own self-developed "go-tos," and it's our Family Recipes. If any readers have kids heading out into the world and you send them with a family recipes cookbook and their own toolbox, they will go far. Okay, your turn--what are the books that are your go-to cookbooks? --Jenn the Suburban Greenmom, who forgot to sign her post yesterday! oops! Uh, these sound amazing! I too love the Moosewood cook books and recently discovered the amazing Crock Pot cook book. We just got a crock pot and this cook book has produced some incredible stuff. We also tweak recipes and use additional seasoning, etc. For the most part though, I'm a big fan of the "look it up on the internet, choose the best one, and feed off what the other recipes say too...."
Sort of embarrassingly, Joy of Cooking is a constant reference to get me started! Also Julia Child's "How to Cook", another reference. My favorite for cool recipes, tho, is Moosewood Lo-Fat Cookbook. I gotta say, tho, that the internet is great for putting in a list of ingredients you want to use and seeing what comes up. I also took with me a very thick binder of recipes I've collected from all over. my favourite cookbooks are recipes from people i know... kitchy... yes. but at least i "know" that these people don't have crazy fancy stoves or ingredients that i won't ever find around home. My favourite favourite go-to is a cookbook my late aunt wrote and signed to me before she passed away from cancer. I love that book and it's filled with recipes that she used along with her favourites from the community. I love seeing "Tante Margarite's White Bread" or "Rosie's Gingerbread cookies" along with some traditional Acadian French recipes. My "go to" cookbooks are the 3 Moosewood cookbooks that are so used, the covers are falling off. Another great one is the Tassajara Bread Book and recently I have become enamored with 12 Best Foods Cookbook. I use the internet a lot also.I definitely want to try some of these one mentioned in your blog. I find the dis on Susan Powter really interesting especially since the rest of the world is finally catching up with what she's been talking about and living for 15 years. Have you seen her? Check out her site, she still looks fantastic and she was always a proponent for complex carbs like brown rice, not white bread. Sorry for the dis--and I did recommend the book! And I will go ahead and modify the original post to add the "IMO" concept. I do find Susan P. way too kitchy and markety, and even now it looks like her mantra is more about "fat calories are worse than other calories" and I'm concerned that her whole "fat formula" thing overshadows the at-least-now-fairly-accepted idea that it's not about carbs vs. fat, it's about good carbs and fats vs. bad carbs and fats. But if what she does works for you, awesome! My battered copy of Joy of Cooking is always a go-to for me. My most recent fave is Simply in Season. It's another one by the Mennonite Central Committee, makers of the More With Less Cookbook and it's full of tasty, seasonal recipes. I also love my Moosewood cookbooks. My go-to books are always Joy of Cooking and Fannie Farmer. I can find everything in there! I also love Joy of Canning and Preserving. The only two ever used around our house are a Better Homes and Gardens "New" Cookbook (from around 20 years ago) and the Vegetarian Bible. The BH&G cookbook is used for one recipe, and it's the cheesecake recipe my grandma wrote down and shoved in the dessert section of the cookbook. The Vegetarian Bible was a new purchase (I had a gift card... spent it wisely at Ross). We don't cook veggies around here (except from a can) and I'm not big on meat. This book is like a how-to for people who grew up on fast food and want to know what to do with a carrot besides dipping it in ranch dressing. I love my vegan japanese cookbook: Japanese cooking Contemporary and Traditional: Simple, Delicious and Vegan by Miyoko Nishimoto Schinner. I like How the World Vegan and Garden of Vegan. Don't use it much now but Pita the Great by Virginia T. Habeeb is a fabulous book for making pita breads. My two old standby's are "The Joy of Cooking" and the BHG. My favorite soups actually come from a diet book, "Dr. Kushner's Personality Type Diet." Sounds strange I know, but the chicken-barley chili on p. 224 is especially tasty and can be used as a base for a lot more than just chicken. Then there's "The Wellness Encyclopedia of Food and Nutrition." It's published by UC-Berkley and while it's not a cook book it tells you just about everything you ever wanted to know about food. It's tag line is "How to Buy, Store, and Prepare Every Variety of Fresh Food." A new acquisition is "The Flexitarian Diet," Dawn does a great job of introducing both grains and beans and about half of the book is recipes. I haven't had a chance to try many of them yet, but they sound wonderful and the couple I have tried are really good.